Composition's knit cotton/lycra johnny collar 3/4 sleeve pullover is made of 14 gauge fine jacquard knit. 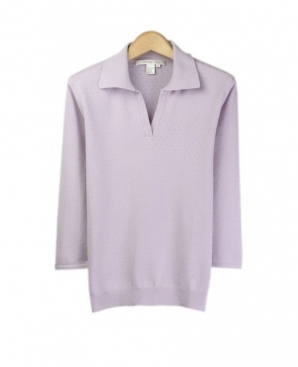 This pullover is made in a super fine cotton and has a touch of lycra for easy-fit and comfort. The delicate single jacquard pattern makes this fine knit top an elegant piece. 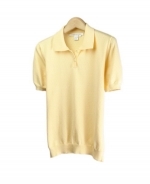 It is a comfortable and high quality spring and summer fine sweater. Available in 7 beautiful colors: Black, Blue, Cantaloupe, Coconut Brown, Latte, Periwinkle, and White.